WideCells Group PLC, the healthcare services company focused on providing stem cell services and ground-breaking insurance for stem cell treatment, is pleased to announce that following the Group's General Meeting held earlier today, all resolutions were duly passed. As a result, the Placing (see announcements dated 10 May 2018, 5 June 2018, 11 June 2018 and 12 June 2018 for further information) is now unconditional, save for Admission. An application has been made for admission of a total of 68,698,355 new ordinary shares of £0.0025 (Ordinary Shares) each, (being 67,865,022 Placing Shares and 833,333 Fee Shares, as set out in the Company's prospectus dated 12 June 2018) on the Official List of the FCA and to trading on the London Stock Exchange's main market for listed securities (Admission). Admission is expected to take place at 8.00 am on 29 June 2018. 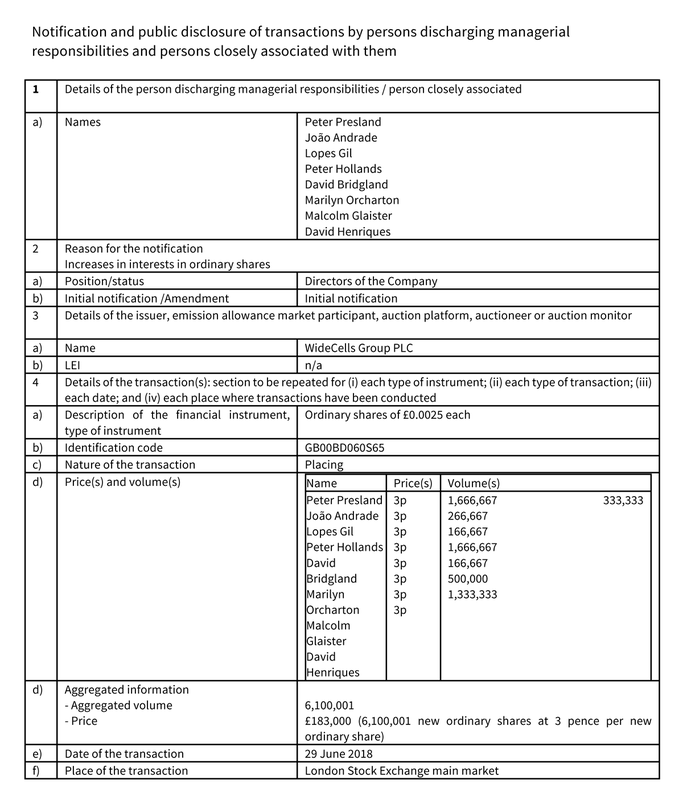 Following Admission, the Company's total issued share capital will consist of 133,519,365 Ordinary Shares. As each ordinary share carries one vote the total number of voting rights attached to the ordinary shares in the Company is 133,519,365. This figure may be used by shareholders as the denominator for the calculations by which they will determine if they are required to notify their interest in ordinary shares in the Company in accordance with the Disclosure Guidance and Transparency Rules of the Financial Conduct Authority. CellPlan: the world's first stem cell healthcare insurance plan with financial cover for medical treatment, travel and accommodation expenses and concierge service to manage the treatment process. WideCells: The Institute of Stem Cell Technology has been established and is based in the University of Manchester Innovation Centre to provide stem cell storage services and focus on stem cell research and regenerative medicine. Its international cryogenics division specialises in stem cell storage, with the Group currently offering umbilical cord blood and tissue storage services to clients in the UK and Europe under the brand name BabyCells. WideAcademy: an education and training division to promote awareness of the benefits of stem cell storage across the global general practice community. Cord blood (which is taken from the umbilical cord) provides the most effective source of stem cells for families due to it being simple, safe and painless to collect relative to other sources of stem cells such as bone marrow - WideCells will focus on promoting the collection and storage of cord blood. Since 2005, there has been a 300% increase in the number of illnesses that can be treated using stem cells. 82 illnesses can currently be treated using stem cell procedures. This announcement contains inside information for the purposes of Article 7 of the Market Abuse Regulation (EU) 596/2014 (MAR). On publication of this announcement, this inside information is now considered to be in the public domain.